We thoroughly enjoyed our experience at this hotel. The staff and service was amazing. The only slight downfall was the double charges on beverages and soft drinks. And the location of hotel although right next to the beach, there was way too much crowd and traffic as soon as you went outside you were approached by sales people trying to give you brochures and that was really annoying. Good location, great staff.. the property is looking tired though.. needs a good overall tidy up and update even cosmetically to external facilities. The room we were in was clean and comfortable but a little dated. Overall we had a nice stay. Kids loved it. Great pools and central location. Clean and friendly. Extra expenses for kids activities, breakfast upgrades and proper coffee which was unfortunate and unnecessary due to the price you pay to stay there. Fantastic holiday at a fantastic hotel! We had a great holiday at the Hard Rock Hotel in Bali! The staff were incredibly friendly and always ready to help! They rooms were great, really clean and great size for our family of 4. The breakfast buffet was wonderful and a great place to start our day. Kids loved the food! The pool area was the best part of our stay, we loved it! To be able to hire a cabana for the day and relax as a family was one of the best times we had in Bali! Pay the extra and enjoy rock royalty. The staff are wonderful and the services are amazing. Thoroughly enjoyed our stay. Excellent service and fab pool area. Could not fault the service. Very friendly and happy staff. Pool area is huge and has lots to do for small & big kids. Entertainment at the pool was great too. We absolutely loved our stay at the Hardrock. so much so we didn't really do much else. The staff were so friendly and the kids adored all the pool side entertainment daily. We really enjoyed the opportunity to relax too. We have a child with Coeliac disease and the staff were so accommodating. They were willing to put something together not on the menu to ensure she had a meal that wasn't going to make her sick. We really couldn't have asked for better service. Fabulous hotel. Staff were super friendly and addressed us by name after meeting us once. My little girls loved the housekeeping fella. He was a gem. Each day he made them little animals made with towels. Such talent. Pools beautiful, food was amazing and rooms were spotless. Hard Rock in Kuta was excellent location (beach across the road, restaurants and shopping). Facilities were great especially the pools and activities. Although we didn't use it the Kids Club it looked great too. Paying extra for Rock Royalty was well worth the money. The private dining area, swimming pool, evening cocktails and soft drinks, photo shoot, afternoon tea and nightly canapés and unlimited coffees was definitely worth it. Staff were all fantastic and very accommodating. The only thing that could be improved on was quality of food at the main buffet (not the a la carte breakfast option for Rock Royalty..that was great). The buffet was only average with not many good options. The sweets were limited to a couple of slices of different cake and fruit. No ice cream included either. In saying this the buffet was much cheaper than many other buffets I've experienced both locally and overseas so it was probably compatible. I would definitely stay at Hard Rock again. Employees were very friendly & very helpful, thank you. Great hotel, great staff and service but not business room to use computer and printers. That was an inconvenience for me. Definitely would stay at hard rock again. Totally enjoyable experience all round. Hard Rock Heaven. Very family friendly Hotel with lots to do for everyone. Would recommend this accommodation to all. Awesome pool and waterslides, friendly staff. The staff were just beautiful and couldn't do enough for us. In all an enjoyable holiday. Very noisy establishment, room was very small with not much storage space for 5 guests. Staff were very friendly and helpful, breakfast was lovely. Rooms nice but in need of repair. Pools have very little shade and the water was hot (Jacuzzi/spa hot) and not very refreshing. The QUIET pool was always loud with kids running and splashing. Kids activity rooms were a high light however it didnt suit teenagers 14 and above. Everything was double and sometimes triple the price of everywhere else in Bali even when there was a happy hour. I know this has nothing to do with the HardRock but, The bars across the road on the beach were also more expensive than others up and down the beach. Also felt very uneasy not necessarily safe this was due to guards walking all over grounds with machine guns. We had heard so many good things about the Hard Rock but it did not meet expectations. The which played every night was terrible and it didn't matter how far your room was you could still hear it when trying to sleep. We understand it is the Hard Rock and we expected to hear a rock band and would not have minded if they were better. We also asked for a twin bed room as we have a 13 yr old boy and a 17yr old girl, they got a king bed instead. Told there were no rooms available with twin beds. They did supply a trundle bed at no extra cost. The shower also did not work properly in this room. We could not explain what was wrong due to language barriers so it went unfixed. VERY EXPENSIVE food and drinks at the bar and room service. We could not bring in outside drinks as bags were checked at the gate. Room service for lunch took 1 1/2 hours to arrive, after a phone call to remind them. The beds are comfy, rooms clean and breakfast was the usual. This hotel would be could if you have children under the age of 10 but give it a miss otherwise. Although the rooms may be getting a little run down, the facilities, atmosphere and kids entertainment at the Hard Rock Hotel cannot be beaten. The resort and service was excellent. The location of the rooms was a little far to get to. For a family of 4 really expensive to eat at the hotel if u wanted to just stay in and also the beds options could be a lot better. Wonderful stay at Hard Rock Hotel Bali in a Kids Suite. Best value for money as includes use of chillout pool and afternoon tea and evening canapes with cocktails and beer included. The main pool is amazing with water playground, water slides and sandy bottom pool. Kids loved it! The best hotel, has the best pool i have seen at any hotel in the world, awesome, such friendly staff always smiling, just love the Hard Rock Hotel. After arriving we were pleasantly surprised that we had been given a complimentary access to their Rock Royalty program. This service was fantastic!! The staff at the Hard Rock were all amazing, always smiling and welcoming at ALL times. The pool and activities were brilliant (especially during Nyepi day). Absolutely loved our stay!! Had a great family holiday and we were treated like rock stars. The royal level was amazing and the kids luxury suite was massive and had access to the pool . Kids loved it in the room and also so much for them to do around the massive pools . Highly recommended. Thank you hard rock. We stayed for 10 nights in the kids suite, family of 5 and found the rooms were cleaned promptly at 9.00am every morning,turn down service was great every day and a nice touch. Santa visited the kids in the room for Xmas. Great place with top service and entertainment. The pool is huge! We stayed for a week, and everyday was an event at the Hard Rock. There is always something happening, no need to leave the hotel grounds, except for shopping and exploring. Nothing is ever too much for them. The hotel and staff were amazing, very helpful and always friendly and willing to help out in any way. The only down side we found was the price of food compared to everywhere else. Kids club and the kids pool was great the kids loved them both. Housekeeping and hospitality staff always went out of their way to make the stay special for our 7 year son. Expensive, but well worth it for the attention to service. A great way to start your first trip to Bali. Their pool was a hit with the whole family! As always our stay was brilliant at Hard Rock, the location is perfect, rooms great and staff brilliant. Great for families but also adults travelling without children. Great facilities for families, lovely buffet! I would recommend the kids' club. My 7 year old daughter loved it! They had a foam party one Saturday night. It was awesome. They also had a pyjama party 2 x per week ($16?) and my daughter loved that! 6-9pm. The pools are great! There's an area for little kids and some longer slides for bigger kids. There is a sandy beach at the pool as well. I thought the food and drinks were a little pricey for Bali unfortunately but the breakfast buffet was nice. Rooms were very clean and comfortable. They were a little noisey as people come home at night. Staff are friendly. My daughter loved the Kids' Club staff and they loved her! She will always remember them. There is a live band every night in the bar, which is very cool. There is heaps of rock stuff everywhere and you can hear music by the pool and music under water. Go for it if you've got kids, got a bit of cash and want to stay in the 'busy' centre. A fantastic hotel with incredible staff, facilities and service. They were the most wonderfully efficient and have mastered the art of hospitality. There were smiles at every opportuntiy and the most welcoming atmosphere I have ever encountered on any of my hotel stays anywhere in the world. The breakfast buffet was also outstanding. This hotel was superbly efficient across all aspects. Thankyou for the most wonderful 2 weeks our family has ever enjoyed on holiday! We throughly enjoyed our time at hardrock - the staff were always pleasent and helpful - George at recpetion is an absolute delight. We had several staff make reservations for us and call our drivers with no trouble at all. We were both sick on 1 day of our stay in Bali and when I ordered dry toast room service advised that there was a doctor on site - the doctor came promptly and was lovely. We also had a late check out and were able to pay extra to have our room til 6pm which was awesome. The only disappointing this was the shower pressure but still a really good clean bathroom and I am a body builder so the gym was too basic for my needs - but overall the hard rock was exceptional value - the staff are great - we had heaps of fun and we will definitely stay with hard rock again. We had a great holiday. We had 2 children 12 and 14. Good location. Very close to the beach. Would reconsider staying here again. Food and drinks were over triple the price compared to other hotels, bars and restaurants plus they added an additional 20% hotel tax on top of the already expensive price. Rooms were old and haven't been updated since 11 years ago from last time we went. You had to also pay triple the amount for wifi whilst every other hotel, restaurant, shop and cafe offered it for free to their patrons. The swimming pool was great although again $25 to access a small cabana for the day, definitely not worth it. On a positive, the location was terrific. Staff were friendly but again, they have to be helpful as they make a commission for recommending people to particular restaurants. Enjoyed our stay very much so. We felt welcome, relaxed and most importantly safe that our young daughters could move around the hotel and be looked out for at all times. We have already decided that we will be staying at the Hard Rock on our next trip to Bali. Our only negative comment would be the prices are definately raised on drinks and food etc for Bali. Overall a good place to stay. Hardrock was fantastic. awesome pool!!! This was my 5th stay at the HRH first going when it opened in 1998. I keep coming back because of its location,service, friendly and engaging staff and the live music evernight. The venue is secure, the pool probably the best in Bali and the wife is happy with the shopping within easy walking distance. It is also very family friendly. The only complaint I have is that the exterior inside the complex is showing the effects of the tropical climate and could do with a facelift. This hotel has the best staff, entertainment and swimming pool in the world! I have been visiting Bali for 13 years and wouldn't stay anywhere else! The Hard Rock had fantastic entertainment, especially for our two kids (aged 5 & 9), they really enjoyed the kids club and the kids Olympics session daily at 4:00pm. Our disappointment was we had two issues with our room. When we arrived the room had an odor and smelt like mold. After moving rooms, we discovered the toilet was leaking. Thankfully this was repaired by the end of the day. At this stage we were very frustrated. Once all resolved our time was all good, if were to consider staying at the Hard Rock again we would make sure we selected a bigger room to accommodate our kids. I recently came back from having the time of my life at the Hard Rock. It is a great resort and there is so much to do. I spent a lot of my time at the pool bar or in the pool or eating at one of the restaurants. I didn't even really feel the need to leave the resort - I did but the resort was just so cool. Set the kids up in the kids club (which I'm very jealous of), it is fantastic! 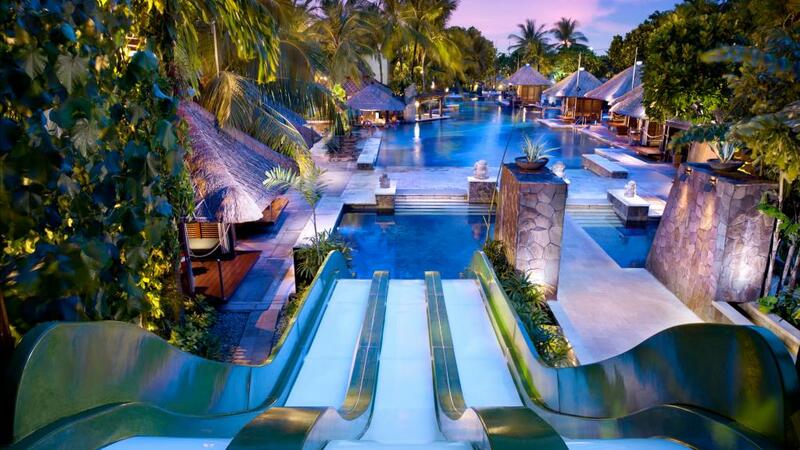 The Hard Rock in Bali is a place you must stay at. I made new friends and had an amazing time. Thanks for recommending that my family and I stay here! !